The citation, given by Sen. Fasano and Rep. Yaccarino, is in recognition of McKnight’s generosity and dedicated service to the North Haven community and beyond. Sen. Fasano (left) and Rep. Yaccarino (right) present John McKnight (center) with a citation at his Washington Ave. McDonald’s location in North Haven. 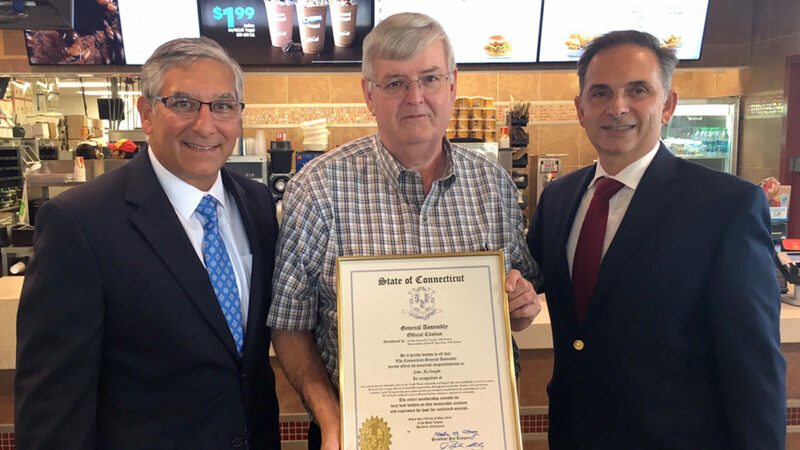 Senator Len Fasano and Representative Dave Yaccarino presented a citation to local McDonald’s owner John McKnight recognizing his many years of community service in North Haven. McKnight, the owner of the North Haven McDonald’s on Washington Avenue, is a supporter of the Ronald McDonald House, North Haven Library, local youth groups and the annual North Haven fishing derby. McKnight hosts concerts on the green, participates in North Haven High School’s Project Graduation Breakfast, and takes part in multiple other community service events throughout the year. McKnight has also hosted legislative updates at his North Haven McDonald’s location to give the community an opportunity to meet with and bring issues to their local state lawmakers. John worked at McDonald’s nearly his entire life starting at age 14. After the previous owner retired, McKnight decided to purchase the North Haven McDonald’s on Washington Avenue. In 2010 he was awarded the coveted Ronald Award for Community Service by McDonald’s, recognizing his dedication to the community.